One of the many rewarding aspects of perennial plantings is that they come up year after year with no help from their gardeners at all. Therefore, locate them where the view from a window, patio or deck will include them. Perennials grow well almost anywhere that meets their requirements for sun, moisture, nutrients, drainage and air circulation. These requirements must be taken into consideration when planning your perennial locations. Perennials require, for the most part, abundant sunshine, although some, such as daylilies will tolerate some shade and others, such as bleeding heart will thrive in it. But the majority will grow weak, spindly stems with few flowers and fall victim to infections without ample sun. Plant with mature size in mind and allow plenty of room between plants so they don't compete for light, water or nutrients. Place taller-growing plants in the back and smaller plants in the front so the tall plants don't shade out smaller plants. Be aware that if you locate perennials beside a building or a wall an allowance must be made for sun, water and air circulation requirements. Leave at least three feet of space between the building and your planting. Not only does this allow for good movement of air, but it will give room for the gardener to get behind the beds. Even the most undemanding gardens need some weeding, fertilizing and scratching of the soil. Also remember that brick, stone, and concrete all have the tendency to reflect or absorb and rereadiate the sun's heat. This may make conditions too warm for the plants and encourages plants to sprout prematurely in the spring, only to be nipped or even killed by late frosts. 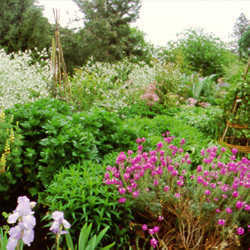 Perennials are natural choices for rock gardens and borders of all kinds. If planting around trees, hedges or shrubs leave enough space so that your perennial plants do not need to compete for nutrients or suffer from shading from the larger plantings. Remember that you are planting perennials for years of bloom. Make sure that your soil meets the needs of the plants. If you are unsure as to your garden's soil type (and wether you need to add amendments), contact your local Cooperative Extension Service for soil testing procedures. This process will help you to determine whether you need amendments for your soil.